The first time that I stopped in at New York 2 Chicago Pizza, I had already eaten and just wanted to pick up a menu. The place was new, and I was intrigued by the name- I hoped that it meant that they were serving authentic New York and Chicago style pizza (well, as authentic as you can get without being there). I was in luck- the owner told me that he had operated other restaurants, but hadn't had the oven to do the pizza the way that he wanted to. He said that he has the right oven now, and that he makes his dough fresh every day. Not only that, but he uses a different type of dough for the different pizza styles- no 'universal dough' for all of the pizzas. Just what I wanted to hear! When I came back to eat the next time, I opted for the New York style pizza. The girl at the counter asked me how much sauce I wanted- light, medium, or heavy. This was new. I thought I'd go middle of the road, and asked for medium sauce. 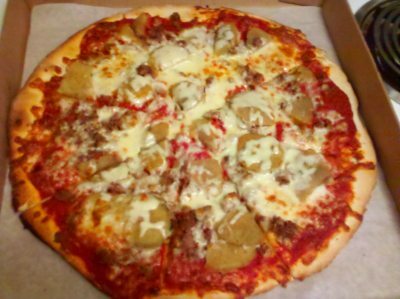 Since I hoped for something different, I ordered sausage and eggplant on the pizza. I've had sausage on a pizza before, but never eggplant. I wasn't sure what to expect. One other thing when ordering at New York 2 Chicago- they only have one size of pizza. I didn't think it was a big deal, but some might think it's odd for this area. I would have ordered a large anyways, and the New York style is a 16", 8 cut pie. 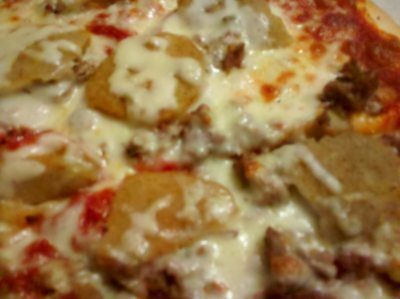 When the pizza arrived, I realized that the eggplant were breaded and fried slices. No complaint there- although my arteries weren't thanking me, I was delighted. The sausage was the crumbly-type and very good. As for the pizza itself, it was really good too. Just enough char on the bottom, and the thin crust was crunchy and just a little chewy. All in all, a pretty damn good pizza. I've had pizza while visiting NYC, and I think that this is right up there. Well, it's at least as close you'll get without going to New York (I've always heard that it has something to do with the water...). I'm looking forward to trying the Chicago as well as the other styles. I'll post more then!